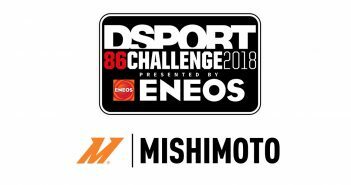 DGARAGE Remove the games of drafting behind other cars, playing chicken in braking zones, or sharing the road as you battle in tight corners and you have time attack racing; one of the purest forms of motorsport. The goal is simple: build the fastest car possible and put a capable driver behind the wheel. When the winner is determined only by the quickest lap time, there are no politics and no excuses. While Time Attack racing in the United States doesn’t hit on the glitz and glamour of IndyCar or NASCAR, it still serves as a premiere proving ground for shops, parts manufacturers, tuners, and drivers. In California, Global Time Attack’s (GTA) Super Lap Battle is the pinnacle of time attack competition. While many individual competitors and small-operation privateers make up the majority of GTA’s grid, some aftermarket industry names leverage this event to showcase their performance ability. For 2017’s running, the minds at REMARK decided to put together a race entry in the form of a 2015 Volkswagen Golf GTI Mk7. REMARK, a relatively new player to the tuner aftermarket, decided in early 2017 to launch a new project to enhance the company’s brand and reputation. The company’s products have made appearances in publications and on race cars, but the team decided it was time to take the lead on the next big venture. 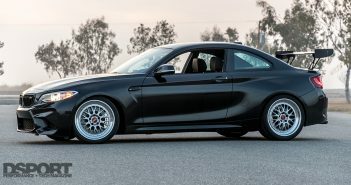 This time, REMARK plans out and oversees the development of its own time attack race program, putting on a display of the company’s direct interest and involvement in the automotive performance community. The 2017 running of Global Time Attack’s Super Lap Battle marks the company’s first foray into a project of this scale, so the team spared no effort in this undertaking. This started with building the right formula of driver, parts, and platform. The team’s goal resided in GTA’s Limited Front Wheel-Drive class, which offers the most freedom in modifications while maintaining some trace of a production street car. This keeps the builds from entering the potential spending games of the Unlimited classes, while allowing room for high-quality performance parts and custom engineering. The REMARK team opted for a 2015 Volkswagen Golf GTI Mk7; the latest generation from the long lineage of hot hatches from Germany. 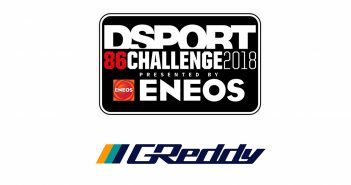 The selection of this vehicle caught Volkswagen’s interest, who decided to offer up one of its own Global RallyCross drivers to support this effort. As a result, former Formula One and NASCAR driver Scott Speed earned the driver’s seat. A high goal was set, a Golf GTI found its way to the drawing board, and a pro driver made the roster. Next, it was time to tear down the car and start the build. GReddy, a distributor for REMARK’s exhaust components, would take the helm for the car’s teardown and rebuild. It didn’t take long to dismantle the GTI down to a bare chassis. 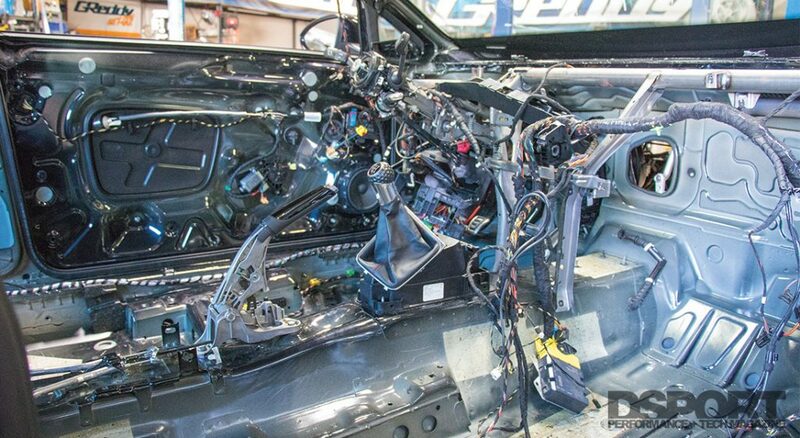 While the empty body would receive its own treatment of safety additions and handling upgrades later, the GReddy team readied the new heart of the machine. This meant doing away with the factory 220-horsepower 2.0-liter turbocharged engine, and trading in a more capable version from VW specialist APR. 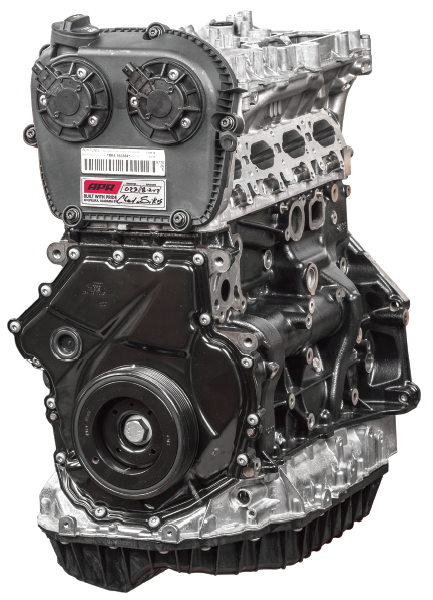 The company’s offering takes the form of the 2.0T EA888 Gen 3 Crate Engine, available as a fully assembled long block from a customer-supplied core. Each of these engines from APR start in completely disassembled form, laying the foundation for a complete blueprint and rebuild. APR designed the 2.0T EA888 Gen 3 Crate Engine to tackle the raised demands of performance components in stressing environments. This starts with checking for leaks and damage before proceeding to cleaning and a detailed inspection. APR checks surfaces for flatness and decks them if necessary, then bores and hones the cylinders with a torque plate for straightness and proper piston ring-sealing to the cylinder walls. This slightly increases the displacement from 1,984cc to 2,008cc. They then line-hone the main bearing bores to ensure a straight path and perfect roundness. The crankshaft is then balanced, the journals are polished, and tolerances are checked to set the stage for new parts and assembly. Durable 4340 forged steel I-beam connecting rods and 2618 alloy pistons provide superior strength and longevity, while ARP 2000 series head studs allow for higher cylinder pressure and lower the risk of head gasket failure. A set of 2618 aerospace alloy APR pistons fill the cylinders, utilizing inboard strut style forging, dual high-pressure pin oilers, and oversized valve pockets with an armor plating on the piston crown. APR balances these pistons to +/- 0.5 grams. APR’s 4340 forged steel I-beam connecting rods hang onto the pistons, paired with ARP 2000 rod bolts and Ampro wrist pin bushings. In order to enhance strength further, the rods are heat-treated, stress-relieved, shot-peened, and magnafluxed. On the top end, APR’s XH-426 stainless steel exhaust valves and NK-842 stainless steel intake valves manage air to and from the cylinders. APR machines a multi-angle competition valve job to improve flow further. 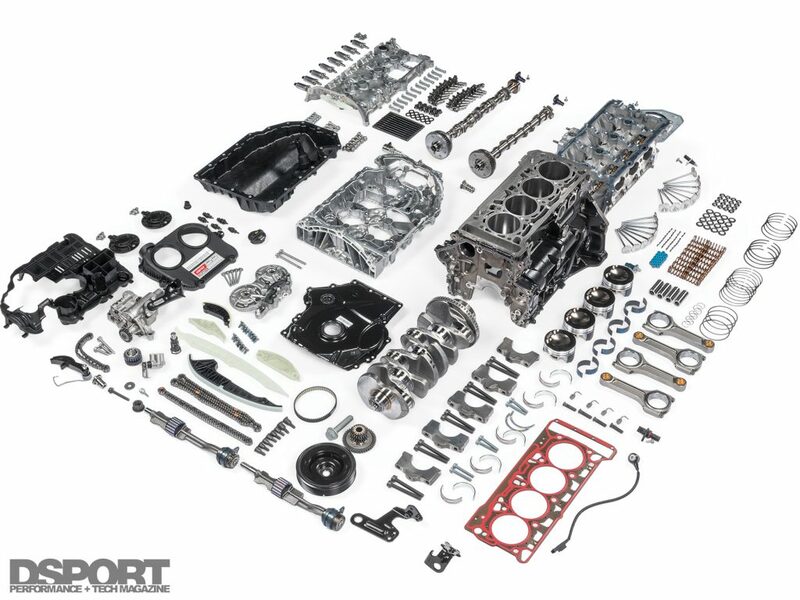 Since the combination of increased power and a motorsports environment adds to strain on components, APR replaces the OEM valve springs with its own lighter weight version. These springs are made from ASTM A877A OTSC round wire steel. The valve spring retainers are also upgraded, made with an American 6AL4V titanium alloy that brings their mass down to less than two grams each. The head clamps to the block by way of ARP 2000 studs, allowing for increased cylinder pressure without putting the head gasket at risk. The bored, balanced, blueprinted, and fully assembled engine package arrives nearly ready-to-run from APR; an engineering firm with a strong reputation for VW performance. At the front of the assembled engine, a Fluidampr performance damper controls crankshaft torsional vibration. This may sound like a small problem with some benefits, however, as the reduction of vibration at this level significantly reduces wear on components over the long term and even frees up horsepower and torque. When every other component inside an engine is balanced with precision, foregoing a proper damper on the crankshaft undoes half of that work. Fluidampr’s products are application specific, so the installation of this performance damper was a quick and simple bolt-on procedure. With APR’s 2.0T EA888 Gen 3 Crate Engine shipped nearly ready to run, the GReddy team could add the remaining upgrade components to power up this GTI. The EFR7163 has a divided twin-scroll turbine housing and lightweight 71mm forged-billet aluminum compressor wheel for exceptional low-end response. 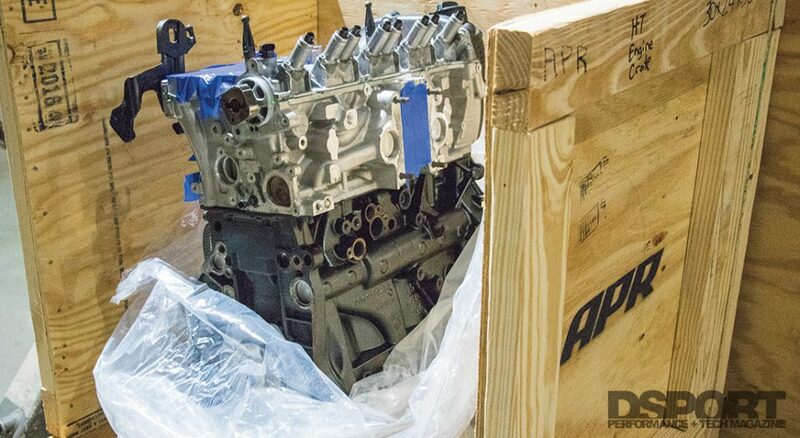 The strengthened engine from APR opens the door for reliably increasing horsepower. Given REMARK’s goal of hitting the 500 horsepower mark, APR’s EFR7163 Turbocharger System would offer the best chance of getting there. 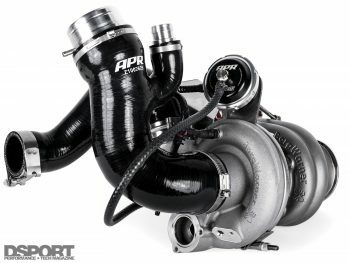 APR offers this upgrade specifically to complement the crate engine, advertising up to 536 horsepower and 10-second quarter mile passes. This is accomplished with the BorgWarner EFR7163’s giant 71mm forged-billet compressor wheel and air flow capabilities of up to 60 lbs/min. This helps add power to the top end, while low-end and mid-range responsiveness are improved with the help of a titanium aluminide turbine wheel and a T4 divided twin scroll turbine housing. These characteristics are highly desired at Buttonwillow Raceway on its 13CW configuration. The likes of the sharp Off-Ramp hairpin turn and the high speed Esses onto the straightaway before Sunset corner call for power delivery at a broad RPM range to pull off quick lap times. While the Super Lap Battle event takes place in November, this track is no stranger to blistering temperatures. 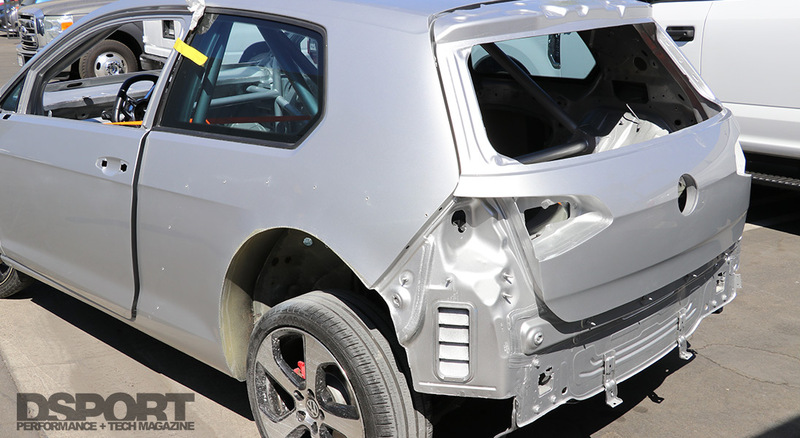 In order to prevent heat soak, the team equipped the GTI with an APR intercooler system. This solution fills in for the OEM intercooler in the factory location, effective for 500+ horsepower builds and tested by APR to deliver over 20 horsepower. Although time attack racing usually means running a car for short stints at a time, the car is always run hard and likely frequently track tested. In this case, the factory radiator isn’t enough to reliably deliver efficient cooling and longevity. The team found a solution to this in Forge Motorsport’s aluminum radiator designed to deliver greater capacity and improved cooling efficiency while mounting in the OEM location. 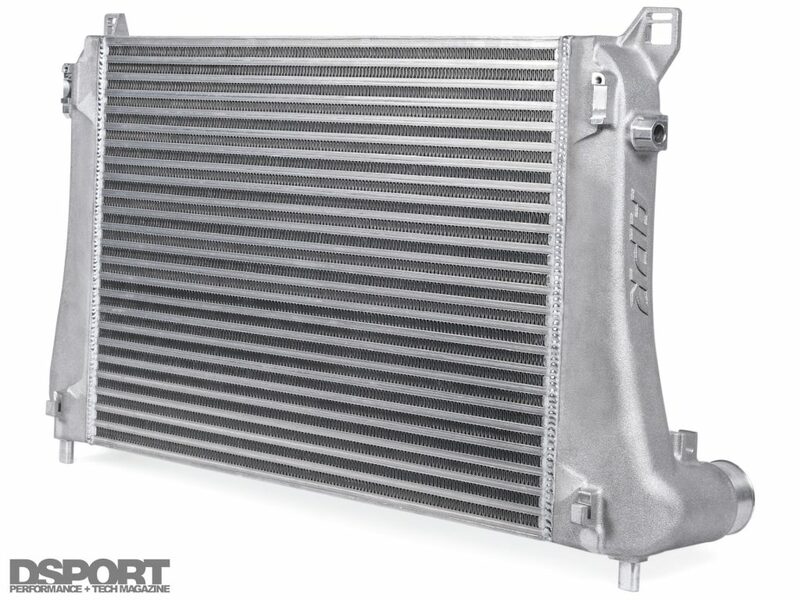 Although it fits into the same area, the Forge Motorsport radiator offers a 40-percent thicker core and 25-percent more capacity for coolant. It even allows room for the factory air conditioning components, but those won’t go back into the car in the interest of weight savings. To maximize the air charge density and reduce the danger of pre-detonation, an APR intercooler is put in place to dramatically decrease the temperature of the air entering the induction system. The updates to the intake side call for the fuel to match. Following in tune of APR power adders, the GReddy team employed APR’s Fueling System Upgrade. This system is also designed to be packaged with the 2.0T EA888 Gen 3 Crate Engine, offering an ethanol-compatible fuel system that can keep up with the turbo kit and other modifications. The upgrade includes a 305 LPH high flow in-tank pump as well as a set of 980cc Bosch Motorsport multi-port injectors. 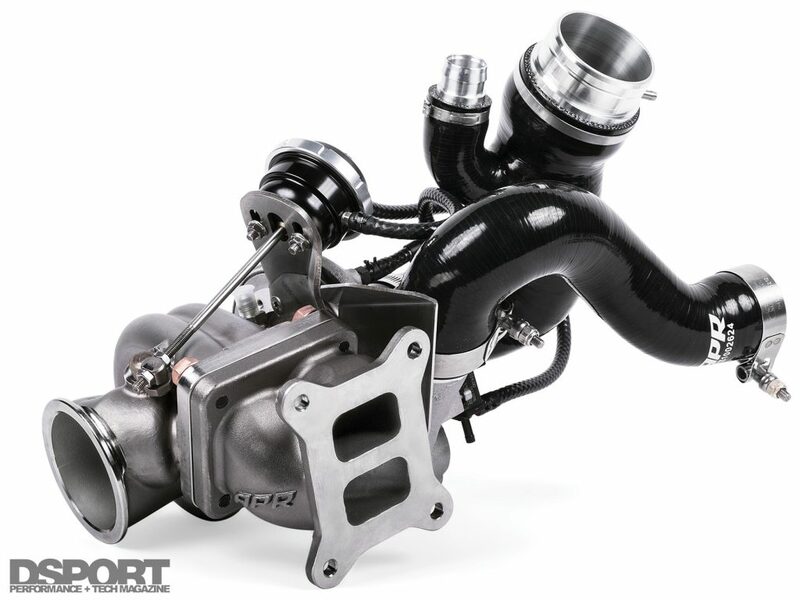 This combination of a strengthened engine, higher performance turbocharger, and a fuel system to match aims to vastly improve the GTI’s track performance. The factory clutch has no chance of holding up against a built engine with a giant BorgWarner turbocharger. To this end, a Stage 3+ clutch kit from SPEC ensures that every last horsepower and lb-ft of torque makes it to the gearbox. The Stage 3+ kit features a carbon semi-metallic full-faced material with a double-sprung hub and heat-treated components for added strength. The high clamp loads and high torque capabilities make this clutch most fit for high performance street cars and especially for track cars. The next step is to make sure that the power reaches the driving wheels effectively. (L) The cam in the center of the Wavetrac® differential activates when at zero axle-load. Each side gear in the differential starts to turn at different speeds. (R) The wave surfaces begin to move apart. This internal load stops the zero axle-load condition. The drive torque then goes to the wheel that has traction. A responsive 500 horsepower may sound manageable for a straight line, but this GTI intends to navigate the twists and bends of a complicated road circuit. Adding to the difficulty, power is only sent to the front wheels, which are put under loads of stress when exiting Buttonwillow’s Off-Ramp, Cotton Corners, and Sweeper turns. Without proper load distribution from the differential, FWD cars tend to plow out of these corners without careful throttle management, thus killing lap times. In an effort to resolve this problem, the team opted for a Wavetrac differential to manage the power output through the axles. 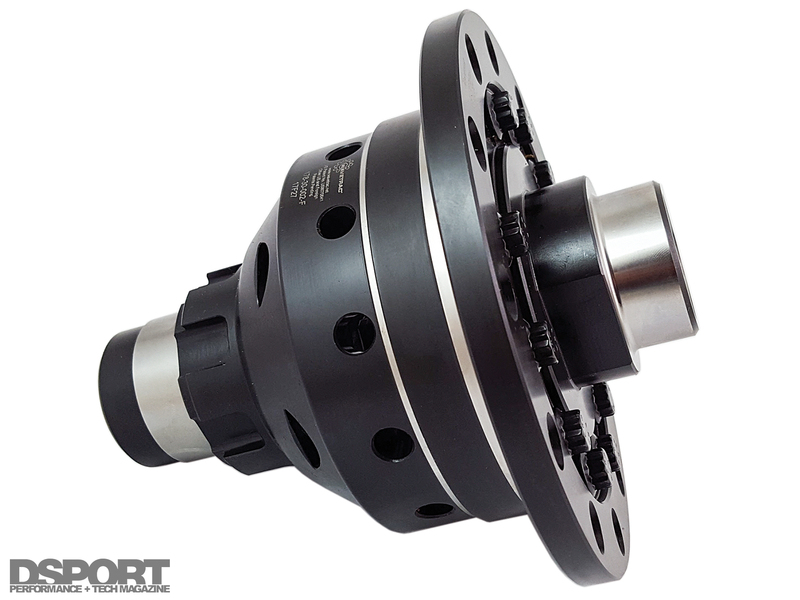 Wavetrac’s limited slip differential uses 9310 steel gears in a case-hardened billet body to handle high-power applications with ARP fasteners used throughout the system. This differential sends power effectively to the wheels with the help of a wave profile built onto the side gear and its mating preload hub. As the two side gears rotate, the wave shape pushes them apart until there is enough load to stop the free-spinning side and then send power where needed. This offers more consistent and reliable power delivery, not only making the car more drivable out of corners, but also quicker to accelerate. With the bulk of the power and drivetrain solution figured out, the REMARK/GReddy VW Golf GTI still has a lot left to go before making the Global Time Attack Super Lap Battle at Buttonwillow Raceway. There’s an expected 500+ horsepower under the car’s hood, but it still must be able to decelerate and make corners in a hurry. This comes with the help of new brakes, suspension, chassis, and aero upgrades that must be specifically tuned to best benefit this particular platform. Timing is coming down to the wire in order to make it to the Super Lap Battle, so stay tuned to see how the entry comes together and fares on track.